Hog Roast Lewes and a Race! 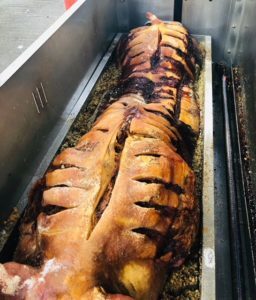 In the recent weeks, the Formula 1 returned to our screens with the beginning of a new season, and the team at Hog Roast Lewes found themselves the hosts of an F1 BBQ. We were first contacted by Gavin, a huge race fan who is backing Lewis Hamilton to gain his sixth championship title. Gavin wanted to mark the new season by having his friends and family over to watch the race, as well as eating some top notch food, and so he decided to hire a Hog Roast to make it extra special. With the Grand Prix being held in Australia, there was a massive time difference which meant British viewers had to be up for 3:15 in the morning to catch the beginning. Gavin had stayed up along with his close friends and family and were going to power through until the race’s end. The team from Hog Roast Lewes were on site from 9PM in order to have the food ready for the beginning of the race. Whilst the chefs butchered the Hog and placed it on the machine to roast, the catering assistants set up a serving table and a protective gazebo outside, so as to be out of the way of the TV. In addition to the mains, the team also served canapes throughout the night, which included the Mini Beef-burgers and Mini Pizzas. On the menu for the mains tonight, was the Hog Roast Lewes classic, pigs in buns – Hog Roast served on crusty bread rolls with a selection of sauces. And the wonderful food didn’t stop there, as there was also dessert, the chef’s special, sticky toffee pudding! The 30 or so guests enjoyed their meals on high quality, disposable wooden crockery as they watched the race unfold. After desserts had been served, there was nothing left for the team at Hog Roast Lewes to do but tidy away their mess discreetly and leave their guests to enjoy the big race. Gavin was disappointed that Lewis Hamilton didn’t win, but he’s still confident that the season will be his. Hog Roast Wedding Feast for a Vegetarian Bride and Groom!